"Bridging the gap between words and understanding, Tara Alisbah's, Turkish Hands is a must-read for any student, professional or tourist seeking-out a meaningful cultural encounter. 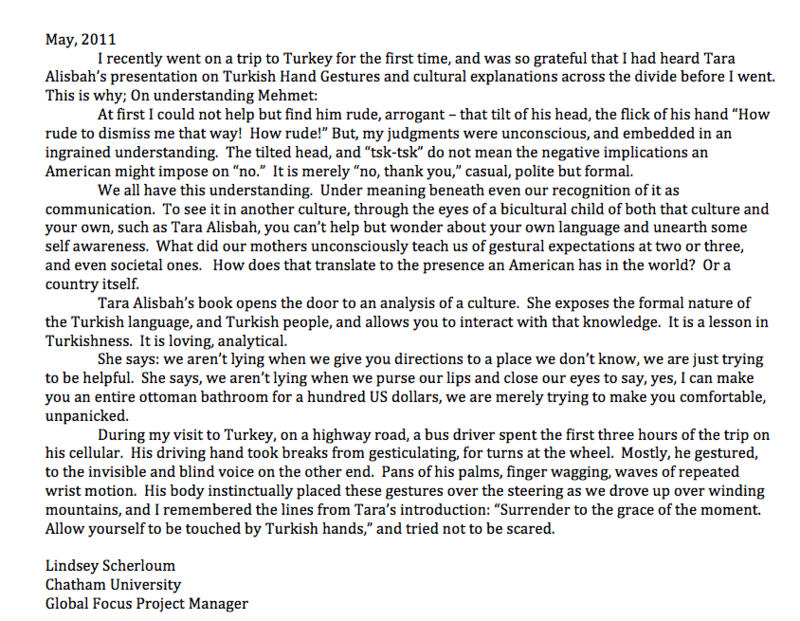 Turkish Hands invites the reader to share in the deep connection Alisbah shares with Turkey and its wonderful people. Even after a combined eight months of study in Turkey, Turkish Hands helped demystify a number of gestures and phrases that had eluded my formal training. If language tutorials provide a window into Turkish culture and society, then Turkish Hands lifts the shutters and throws back the curtains." "Aferin ! I wish that textbooks of Turkish for foreigners included something like “Turkish Hands “. Non-verbal signs are an integral part of a language ! Your book will save future visitors from embarrassment. I well remember my first visit to Turkey in 1955. I already had a BA in Turkish, and, on the first day, when I asked for things in nice literary Turkish, some people slightly raised their heads but said nothing . When I repeated the question , I got a peremptory “YOK !” , and similar results for not understanding other signals !" One of the ways my parents introduced us to a new country was to haul out the globe. Had it been available, I’m sure they would have also given us copies of a book like this. Although it’s described as a “hand guide for tourists,” Turkish Hands is much more than that. With captioned pictures demonstrating each gesture, it’s also a book that kids can use to decipher the unfamiliar gestures and sounds they will hear and see in Turkey. Adults will enjoy this book too. Not only is it fun to read, but it is also interesting and includes invaluable advice that will help them avoid embarrassing situations and make any visit to Turkey more rewarding. It will be in my carry-on luggage when I next travel to Turkey, which I hope will be soon!